Halifax’s hottest improv group Make ‘Em Ups is funny, inclusive and good-looking. 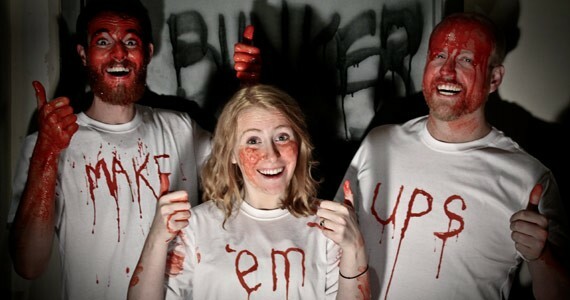 Make ’Em Ups Frighteningly Funny should be a bloody good time. "My favourite thing is that the audience we attract has a great suspension of disbelief. An improviser will say something like, 'I'm just drinking this glass of warmed-up peanut butter,' and the audience goes, 'Ewww.' They're totally on board," says comedian Brian MacQuarrie. 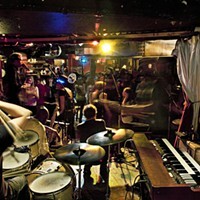 This year, MacQuarrie joined Halifax's hottest improvisational group Make 'Em Ups, a non-profit organization founded in Burlington, Ontario by Owen Stanford in 2009. After a visit to the coast with his fiancée Stephanie Foran last summer, Stanford realized Halifax was perfectly poised for them. "Aside from improv at the high school level, we realized there wasn't much of it happening here," says Stanford. "And I fell in love with Halifax, the sense of community, the pace of everything." Make 'Em Ups has over a collective decade of improv experience. Both Foran and Stanford volunteer with the Canadian Improv Games each year, and both have taken extensive workshops and camps with some of Canada's best improvisers. MacQuarrie is an experienced actor and comedian. Make 'Em Ups debuted this July and has grown incredibly fast since then. Now with 13 members, the group holds a weekly show at The Company House and Oasis Pub, one show a month at The Bus Stop Theatre and workshops throughout the week, soon to be held at Plan B on Gottingen Street. "In the workshops, you can take Level 1, which is an intro to the basic skill-building games," says Stanford. "And then Level 2 is all about stage-craft and putting on a show, leading to performance." Make 'Em Ups alternates the style of improv for each event, from long-form (an episode) to short-form (sketch style) to competitive. It's an opportunity to strengthen skills both on- and off-stage. "If you really commit to Make 'Em Ups, you're going to grow as a performer, as a person. Something magical is going to happen to you," says MacQuarrie. All three say that improv gives them confidence and sharper problem-solving skills in general. Group members overcome anxiety and excel. "We have four or five people in the cast who could easily be some of the funniest comics to watch in Canada," says MacQuarrie, "They're quick, funny, smart." Foran interrupts: "Good-looking." MacQuarrie nods: "Good-looking, for sure. Can we have that underlined? But really, the community is so healthy here." Trust is a major part of a group's success. The actors and the audience must buy in, but the rewards are innumerable. "You soon realize there are no mistakes, you just go with it," says Stanford. "We want everyone to try it. Twice. If you watch comics and think, 'I'm funnier than that guy,' you probably are," says MacQuarrie. "If you're a kid reading this who's always wanted to do improv but can't afford it, send us an email. If you want to do this, we can make it happen. That's why we exist." And the word is out. Make 'Em Ups hits the stage at The Seahorse for the first of a new monthly show opening for The Mellotones. The frighteningly funny short-form Halloween special has a twist. "We're not telling each other what we're dressing as for Halloween," says Stanford. "So the costumes will be an additional surprise of the night. I think that's what so great about improv. It's live theatre. We're making it all up on the spot and it's so intriguing. It's almost suspense. It's very exciting." Whether you like to see improv or want to start performing it, Make 'Em Ups has you covered.